Bayern Munich chairman Karl-Heinz Rummenigge has signed a new contract with the club. The former Germany star, whose deal had been due to expire in December 2019, has agreed to new terms that will run until December 2021. "My colleagues on the supervisory board and myself are very pleased that we were able to reach an early agreement with Karl-Heinz Rummenigge," president Uli Hoeness told the club's website. "He has impressively shown his qualities in this post over the past 16 years and we are sure he is the right man to lead Bayern successfully in the years to come." 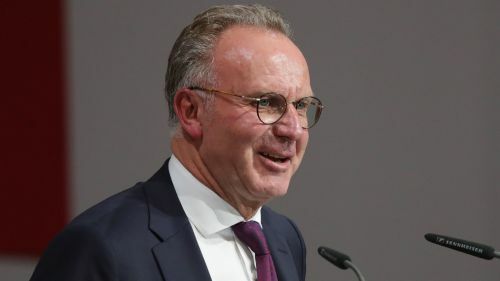 Rummenigge added: "I would like to thank all my colleagues on the Executive Board, all staff and especially all members of the Supervisory Board who have taken this path with us." Rummenigge was twice a Bundesliga and European Cup winner with Bayern as a player before devoting his post-playing career to the club.